December 21, 2015 /0 Comments/in Sheet Music, Singing /by Suzy S.
Are you a singer looking to improve your music reading skills? You’re in luck! 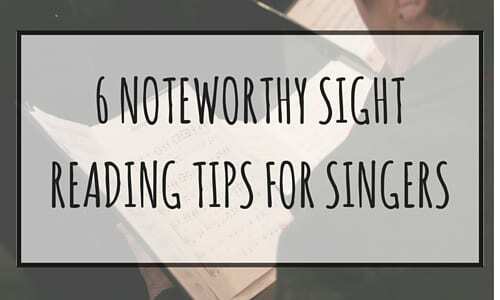 In this article, voice teacher Elaina R. shares everything you need to know about sight singing exercises and tips..
One of the most impressive feats for a singer is the ability to pick up a piece of music and read it. How can you get to that point? With patience, dedication, and lots of practice, you can master the art of sight singing! Singers are lucky that they only have to sight read one line at a time; pianists, organists, and some other instrumentalists have to read several lines at once! However, only we singers have to read lyrics as a well as notes. This complicates things, especially when those words are in a foreign language (as often happens for classical singers). Ready to get started? Sight singing can seem daunting, but it just takes practice. Here are a few things you can do to simplify the process. Check out the key signature. What key are you in? Is it a major or minor key? How many beats are in each measure? Is there a tempo marking? Quickly scan the piece to root out surprises. Is it in mixed meter? Are there tempo changes? Any hidden high notes? This is all helpful information. Play the opening chords, or at least your first note, on a piano. The more information you and your ears have, the better. Establish the beat for yourself by tapping it on your leg or collarbone. This will help you stay in rhythm when things get crazy. I recommend that you practice singing with a metronome to get your rhythms as accurate as possible. If you know what key you’re in, you should know where the movable ‘do’ is (read this article if you’re unsure what I mean). If you know where ‘do’ is, identifying ‘so’ and other key notes becomes easier. Thinking in solfege helps many singers sight read more accurately. If you start to get lost, this is your order of priority. When you practice sight reading, words are not very important; sing “la la la” if you have to. Pitches, while important, are not as important as the rhythm in sight singing. If you sing the wrong pitches and the right rhythm, you’ll know exactly where you are in the music and be able to catch yourself, even if it sounds bad. If you sing the wrong rhythm, on the other hand, you’re in danger of losing your place in the music and having to stop. All you really need for sight singing practice is a piece of music you’ve never seen before. However, sight singing is a lot easier in shorter spurts. 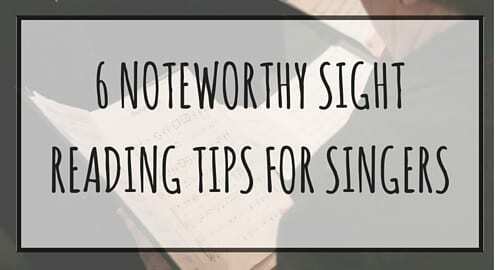 Before you start attempting to sight read full-length songs, try using one of the many resources available for singers who want to sharpen their sight singing skills. There are online resources that provide clips to sight sing and audio tracks to check your work. If you prefer to practice at the computer rather than at the keyboard, this may be a good option for you. One popular service is SightReadingFactory.com, which costs $35 per year (about $3 per month). This is how us music school folks practiced sight singing in college. Although the teacher usually played starting pitches and accompaniment as needed, good sight reading books come with CDs so you can practice sight singing exercises at home. Here is one good example. Need sight reading practice? There’s an app for that! These apps combine sight reading exercises with audio starting pitches and tracks to help you. Music Tutor Free seems to be the most popular free option. One of the best ways to improve your sight singing skills is to join a choir. Choristers learn lots of music on a regular basis, and reading all of that music as a group really helps singers get comfortable sight reading. And of course, working with your voice teacher on sight singing practice within your lessons is a great idea, too. Whatever route you take, learning to sight sing will help you become a better and more versatile singer. Good luck! Elaina R. teaches opera voice and singing in Ann Arbor, MI, as well as through online lessons. She received her Master of Music from the University of Michigan, and she has a B.M. from the University of Southern California. Learn more about Elaina here!